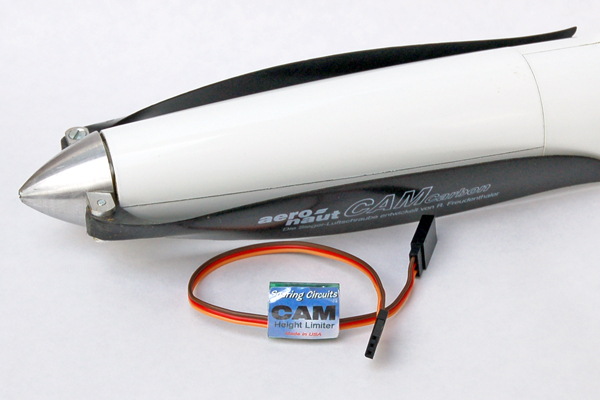 Designed for the new 200m altitude limited electric soaring (ALES) format, the CAM is small, light, and easy to install. Just plug it in between your receiver and ESC. That's it! The CAM automatically shuts your motor down at 200 meters or after 30 seconds per the Academy of Model Aeronautics ALES (AMA Event 631) rules. This new competition format promises to put the "soaring" back into electric sailplane contests. Even inexpensive RTF models can compete! The CAM has selectable cutoff altitudes of 100m, 150m and 200m, and does not require a computer or separate programming device to use. You can easily change the cutoff right at the field. With the CAM you can make multiple climbs to cutoff without having to land. Great for practicing! And, the CAM is designed, built and supported right here in the USA.